You are here: Home / News / The Trump Wall : A Medieval Joke. The Trump Wall : A Medieval Joke. 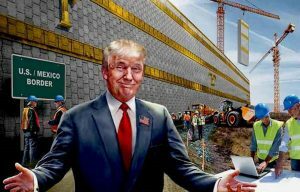 (ThyBlackMan.com) Erecting a giant wall in 2018? Really? This is so hilarious on one side and so idiotic on the other that I cannot believe I am writing an article on this topic. Why then am I writing about Donald Trump’s medieval wall intended to stop Mexicans from illegally entering the United States? Maybe because some of you need a good laugh, others of you need to know the details and yet others genuinely and sincerely need to be informed or want to do something about it. Share this article with every Republican and Trump supporter you can find. When candidate Donald Trump ran for President, he said Mexico would pay for the cost of a wall between Mexico and the United States in order to stop illegal immigration. Trump stated Mexico was sending and/or allowing their “bad hombres” to come here. He stated they were “murderers and rapists” – even though he provided no statistical proof of any of that. Then again he never does. And ironically the Trump approach clearly denies this country was founded by illegal immigrants. Furthermore Donald Trump’s grandfather was a German immigrant reported to have owned and operated a whorehouse in Germany before coming to America. So President Trump maybe you are sitting up far too high on the horse. So what about the fact that more people are coming to America and illegally staying through expired Visas and on flights than illegal immigration coming across the border from Mexico? What about the fact that Mexican is being blamed, Mexico is being targeted for the wall and Mexicans are being stereotyped? What about the fact that Mexicans are being targeted for deportation (dreamers) from America but there is no mention of Asians or Europeans who are here illegally? What about the fact that Mexicans statistically commit fewer violent crimes in the United States than American born African American or Caucasian citizens? Suddenly racism is out of the closet and it’s not funny anymore. If you want to know who is a member of Trump’s base of blind zombie supporters, simply look at those who defend whatever he does. And that is scary or should be to all of us. A wall will NOT solve the problem because the problem is being inaccurately diagnosed in the first place. Furthermore, the United States is not Rome, China or Russia. We do not live in medieval times. The best the most powerful country in the world along with the most powerful political figure in the world can come up with should not be a wall. So what are the other reasons a wall will not solve the problem? A wall between Mexico and the United States will not stop the 40% of illegal immigrants who came here on planes legally and overstayed their Visas. 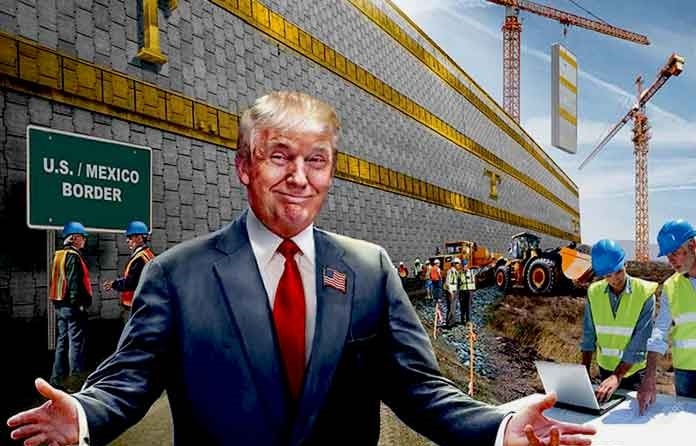 The Trump wall could not and would not be constructed in lakes and other areas between our borders so it will not be a complete wall all the way across. That leaves openings. As for where the wall would actually cover, people could break through some sections, dig under other sections and yet climb over other areas. It would simply be a matter of time before people discovered how to penetrate the wall. Then it would become a continual game of the better mouse vs the better mouse trap. And what about costs to maintain and repair the wall? Is that anticipated and projected in the wall budget? How could it be when there is nothing to compare it to? Unexpected expenses cannot be accurately projected without a reference point nor without knowing how many repair, how often, how much damage or how much maintenance. Donald Trump said “Mexico will pay for the wall“. But Mexico has not agreed to do any such thing. Donald Trump did not outline any way to make them pay for it. Far too many Trump zombies believe whatever Trump says because it sounds good and because they want it. But neither sounding good nor wanting it is a plan that makes it happen. Now, all of a sudden, Trump is factoring in the cost of the wall into our United States budget in exchange for dreamers being allowed to stay here. That was not what he said, that was not his promise and by doing so, the American people pay for the wall. Donald Trump lied again and his supporters in Congress are mixing his wall with other plans they had in place before he became President. Then they are calling it all the same thing but that is a lie as well. Has Donald Trump punked, bullied or hypnotized the entire Republican party? The Trump wall is a racist idea because it only targets Mexicans and neither addresses the illegal Asians nor Europeans nor Canadian Caucasians who come here and stay illegally. It surprises me that Hispanic leaders have not launched a major class action lawsuit and taken this entire issue all the way to the Supreme Court. Wake up people. So President Donald Trump does not want people from Africa to come here. He wants to reduce Mexican immigration. He wants to discriminate against Muslims and implement travel bans that lock them out. He wants to deport Hispanic children brought here through no fault of their own. He wants more Nordic type people from Sweden. He appears to want America “white again” – or at least to return to a time when people of color were not important. Ironically that was also the illegal immigrant foundation of this country by those people so many Americans proudly call “the founding fathers“. These type actions should be paralleled with what Hitler did towards the Jews once he came to power. I suggest you study Hitler’s ideology of “the master race“. The Aryan people went right along with him and the Jewish people never believed their demise would happen until it was too late. What are we seeing the beginnings of? Trump’s base consists of millions of people willing to support, advance and promote his ideas and agenda and that is how it all starts. Wake up people. Share this article with every Republican and Trump supporter that you know. Place it on social media. Do what you can, but do something.